Discussion in 'UFC Discussion' started by mclj1, Jul 30, 2015. Maybe this has been discussed already but isn't this the most important issue before UFC thinks about holding a show at Cowboys Stadium? Im not a expert on the schedule and how they set up the fields but that seems like a quick turnaround for the stadium if there is a game the next day. They have away games basically every other week. ...or the Cowboys are on the road the next day??? I'm sure it won't be hard to schedule around Cowboy home games. They have only 1 home game in Dec. They wouldnt do it the day before a home game. If 194 is at Cowboys stadium its fine. No way will Cowboys make the playoffs without Murray, much less get home-field advantage. What's with the obsession with holding cards in stadiums? 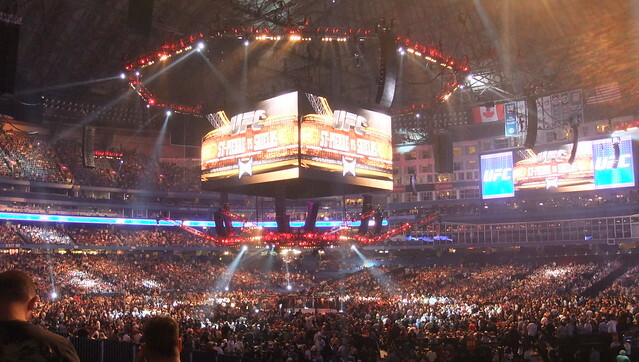 The attendance was down for UFC 185 from the previous two cards held at AAC in Dallas. They'd need a spectacular card to fill up Texas Stadium. UFC just isn't that popular. Conor vs Aldo would do it. Lots of people flying in from Ireland, Brazil, and if they stack the card like they should, from the rest of the US as well. Theyll be just fine without murray,he was good but a bomb Oline makes it that way. I feel Randle will get it done this year. 185 did not offer local hometown boy Hendricks in the main event for the title. But they did get 19k with Hendricks fighting for the title in Dallas. They also don't need to fill that stadium, but they will want a large crowd. I'd guess if they do it, it is because they are believing they can get 60k and make it bigger than the 129 card. I think you're overvaluing DeMarco Murray, and undervaluing the offensive line. Murray is a great running back, but he was 4-5 yards up field by the time he was ever even touched on many of his carries. I do not think the UFC will be holding a fight in any stadium. agreed. Romo is overrated, Bryant need someone that can get him the ball consistently. and their running game is hurt w/o murray. although i've heard good things about randle, but the depth chart has mcfadden starting. They could have it on a bye week, road game week, or in the offseason. They'd also need a time machine.